Character AI — They can get super goofy at times and run around in circles. It’s easy to stop this by switching to control the character but still, it shouldn’t happen. 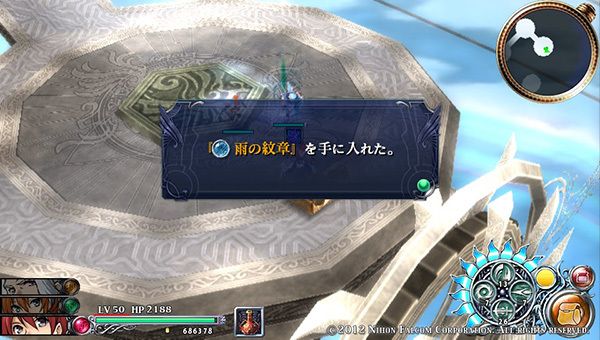 This isn’t as offensive as the stupidity that’s been brought over from Ys SEVEN where the characters will ignoring enemies to continually try and get at a material they can’t reach at a harvest point. Again, a switch to the character will solve it but come on, why would they even do that in the first place? Inability to skip cutscenes on new game+ — It’s kind of annoying to have to sit through everything even with the fast-forward option on. 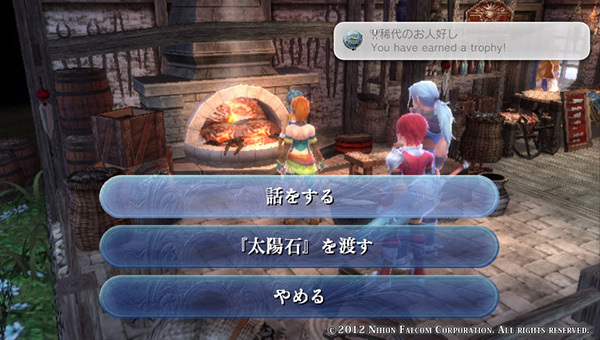 I suppose there’s just too much extra code to include to give the option to skip scenes entirely. 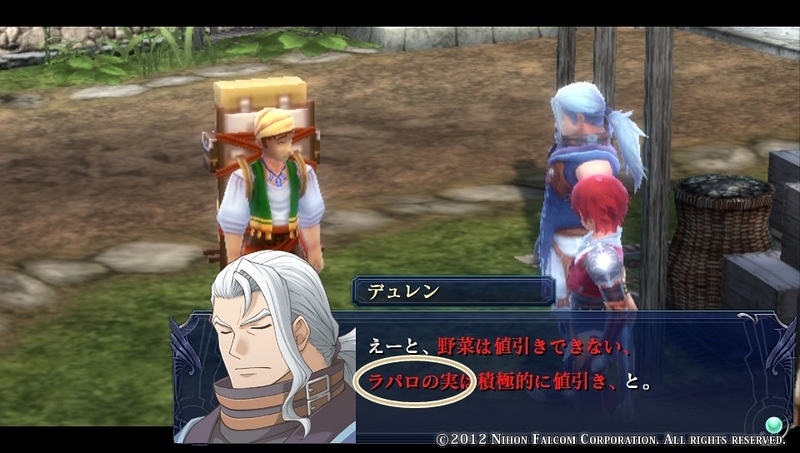 Or maybe Falcom’s just too damn lazy. 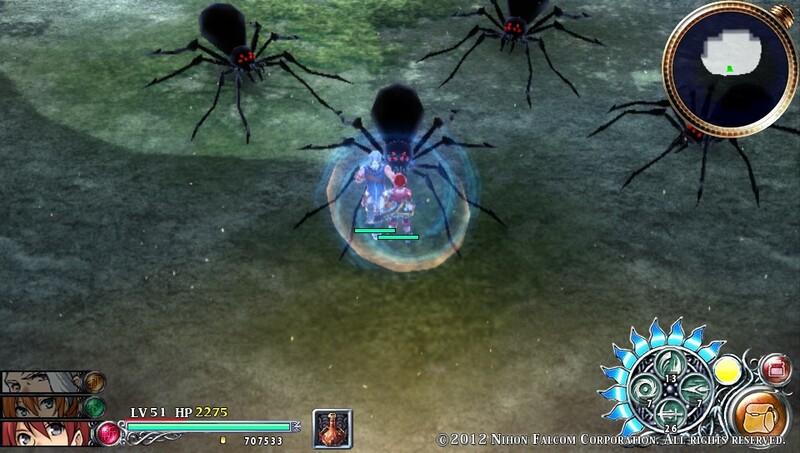 Slowdown — It’s noticable in certain areas of the Forest of Dawn where there’s a lot of enemies. I think there’s a part in the Path of Plateau where it happens too even though there isn’t a bunch of enemies. I take it the background and stuff play a part in that one. More variety for the group configuration bonus. — Uh … forgot what it was called and too lazy to check the manual right now. ^^ (I already stored the game away.) But like, there were only 2 types, IIRC — one which had something about damage and another for increased frequency of obtaining rare items. I think the bonus should have been character based instead of weapon type. 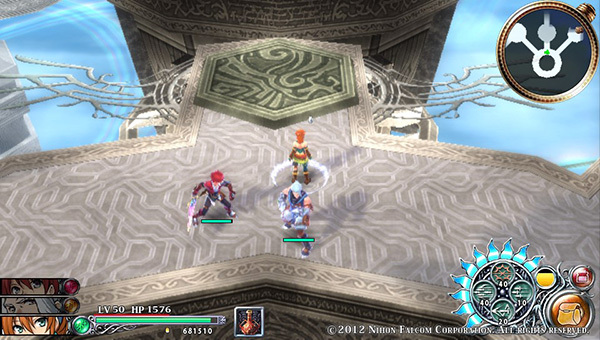 Like Ys SEVEN, the battle system made the game. Battles are fast and really fun! I can’t remember SEVEN too well but I’m pretty sure they honed the mechanics in this one. The dungeon designs are all right. Not all that crazy about them since there’s still a lot of “hand-holding” where everything you need to access another area just happens to be nearby and all. No real challenges or skill needed at any point. Honestly, even though I’m not all that great with platforming, I do like the designs from Napishtim, Felghana, and Origin a lot more than SEVEN and Celceta. 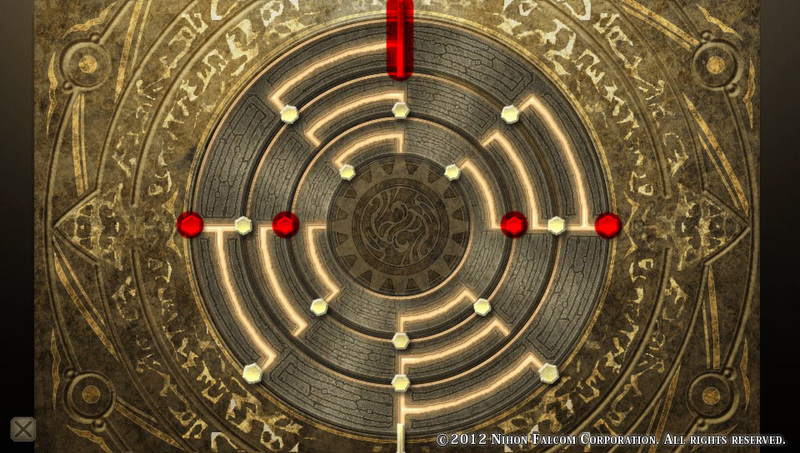 Totally wasn’t crazy about the puzzles in the game because they felt kind of tacked on; like they existed only to make use of the Vita’s touch screen. There were also too far and few of them which makes me wonder why they were even included. Michey is … ugh. Such an ugly design. 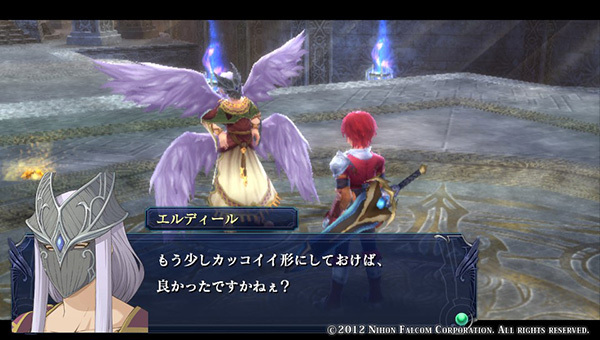 Stupid Falcom. Please don’t make that thing your official mascot. Part of the northern area of the Forest of Dawn sure could have used a waystone. All in all, they were located in convenient spots. I really liked the way side quests were handled where you can see where the quest giver is on the mini map as well as the location of targets were. 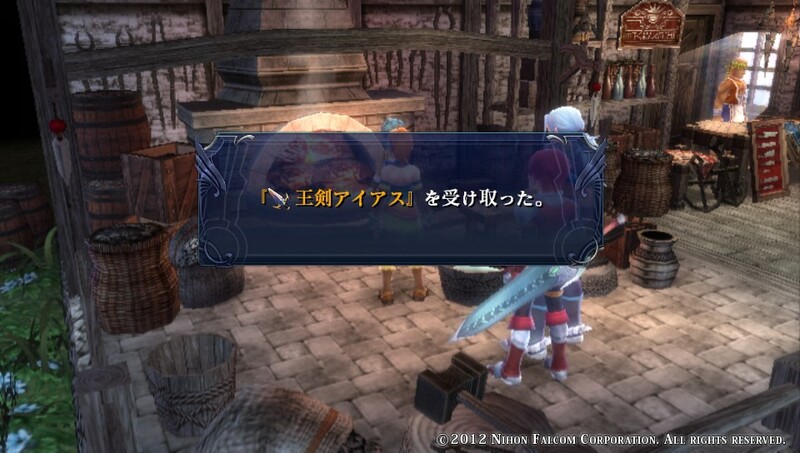 Well, the latter is true for most of the monster elimination quests. I believe SEVEN had you running around towns and speaking to everyone unless you were using a walkthrough which would tell you who to specifically look for. I embarked on my Nightmare run recently. 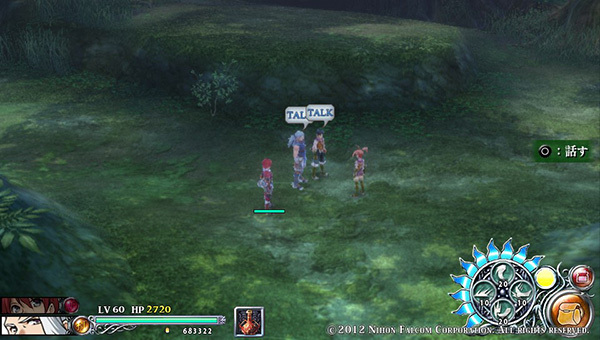 With maxed out Adol and Dulen + massively upgraded ultimate weapons and armour, the trek across Celceta has been fairly quick. The only problem are the bosses. 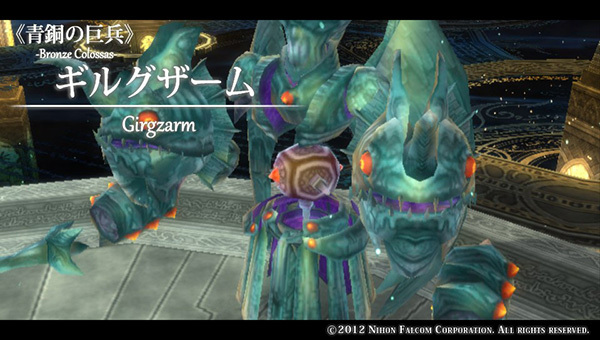 ^^ The first boss took about 10 minutes to defeat. 😛 It took me a bit to clue in that I was supposed to get its stun gauge up. 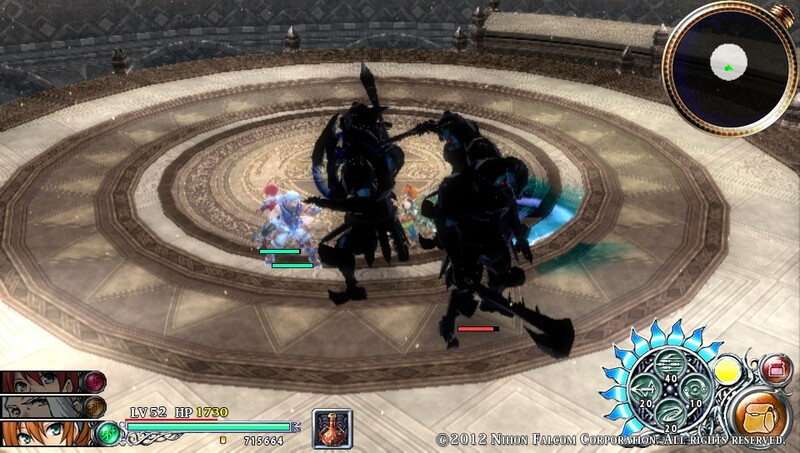 Once I started spamming skills instead of simply slashing its body, the battle went a bit faster. 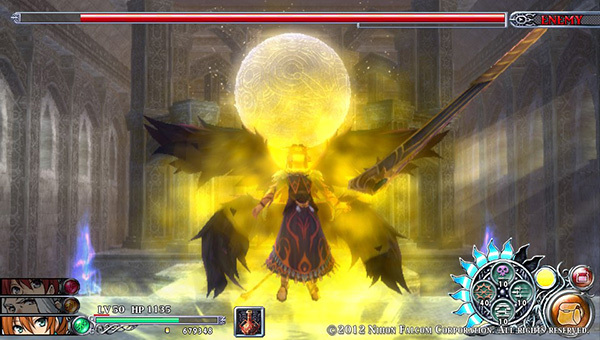 Canlilica was the final character. I regret not using her more throughout the game because it turns out she’s got some pretty good skills! 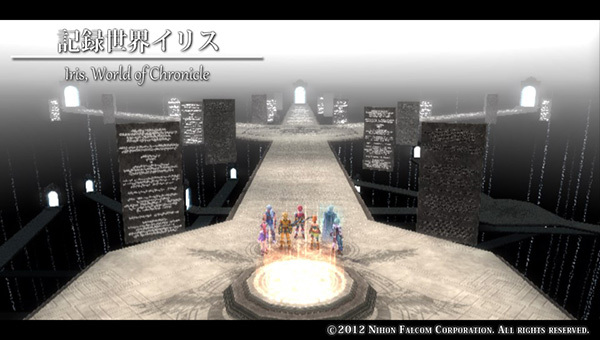 I’m only out on the merchant, Momocha, Mouse, All Items, and Nightmare clear ones. 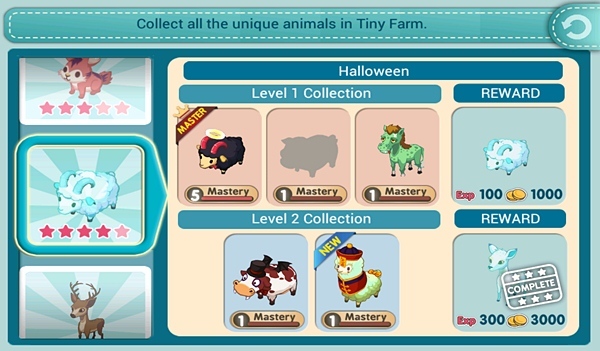 Tiny Farm – Breed a Red Reindeer and Alpaca~! Tiny Farm – Woo! No more need for the ugly Dairy Cow. Well, at least in the near future. 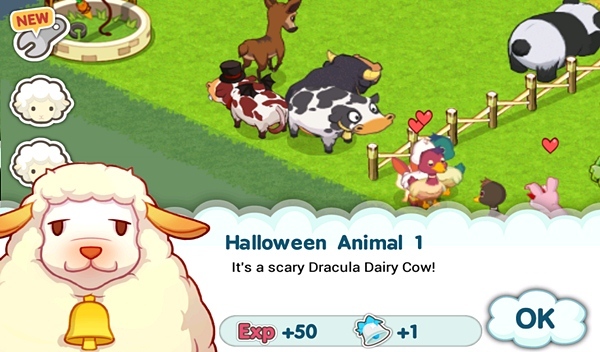 Tiny Farm – Goofy looking Halloween cow~! 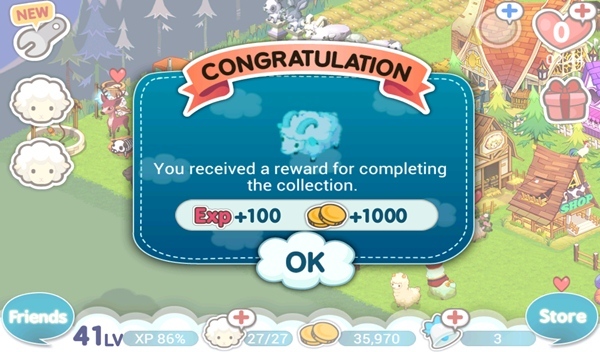 Tiny Farm – Another Bell as a reward! :0!!!! 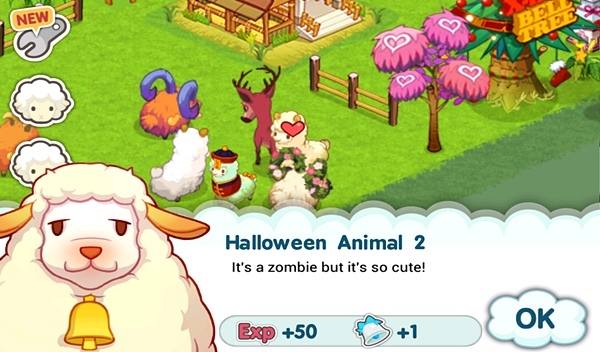 Tiny Farm – Zombie Alpaca Get~! 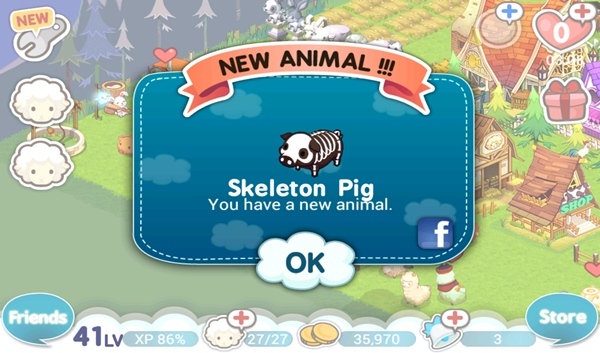 Tiny Farm – Love the skeleton piggies~! 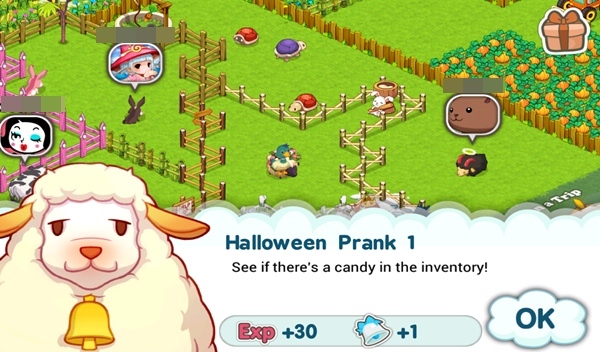 Tiny Farm – The Answer to The Last Halloween Prank: It’s a Talking Spotted Pig~! Tiny Farm – Stupid pig. It took me so many tries to get this. I got it by breeding a Lv 100 Talking Pig with a Lv 5 Talking Pig. 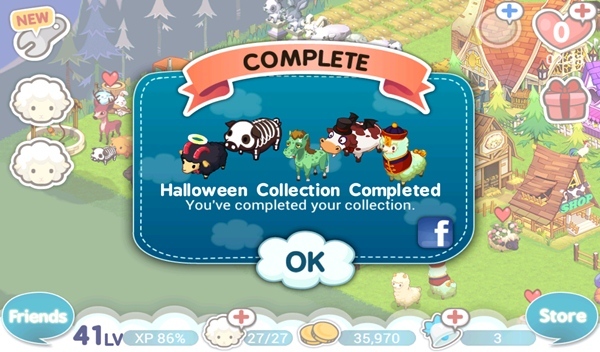 Tiny Farm – All Halloween animals … for now. Who knows if Com2uS will add a 3rd collection next year or not? 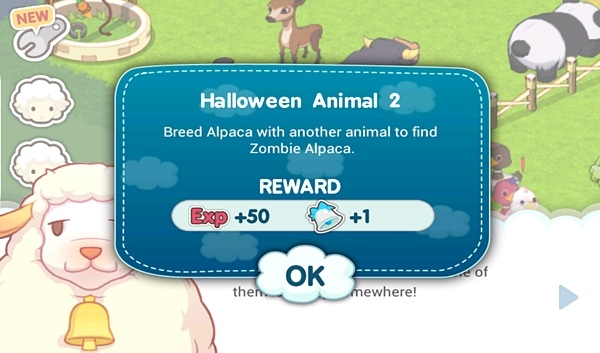 The Dracula Cow and Zombie Alpaca!? The Halloween promotion is in full swing now~! And again, there’s some cross-breeding weirdness! The special animals this time around will complete the Halloween Level 2 Collection. 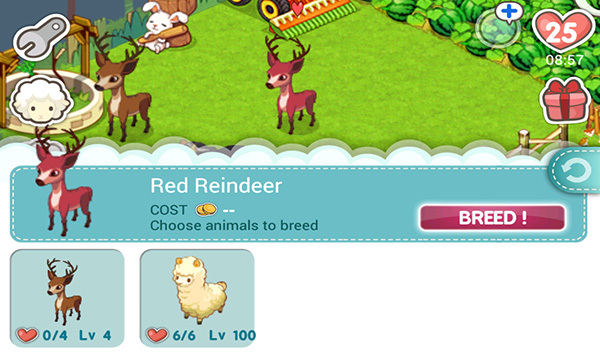 Breed a Red Reindeer and Alpaca~! 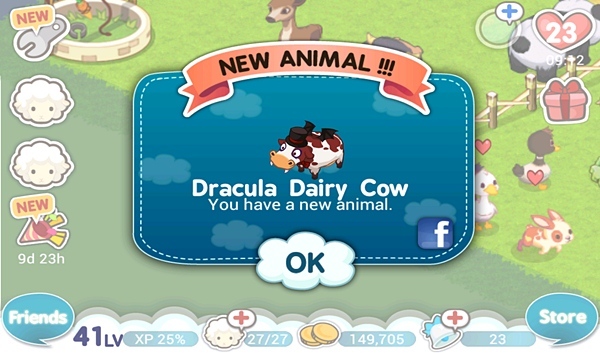 Update on Oct 29th: I got my Dracula Cow! It only took a billion tries!!! Woo! No more need for the ugly Dairy Cow. Well, at least in the near future. 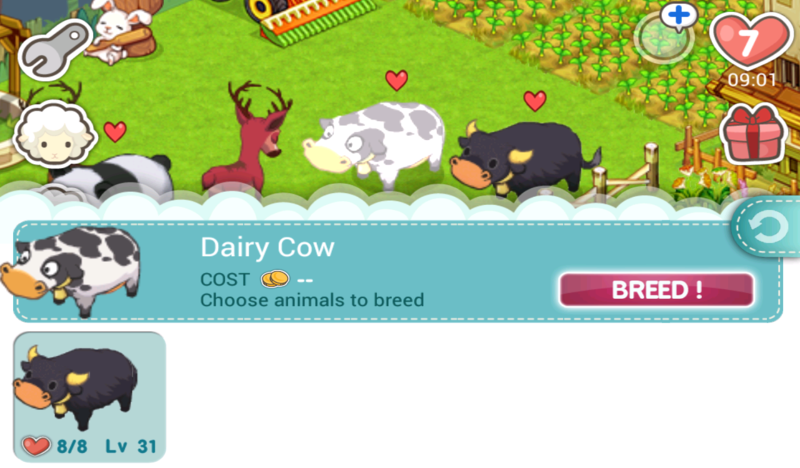 For what it’s worth, my Black Cow was at Level 32 and the Dairy Cow was Level 17. Next up will be the Zombie Alpaca. Sadly, I bred the parents again but it didn’t work. 😦 Only regular reindeer and alpaca kept popping out. I do want another zombie though! There’s more objectives after the breeding’s done~! 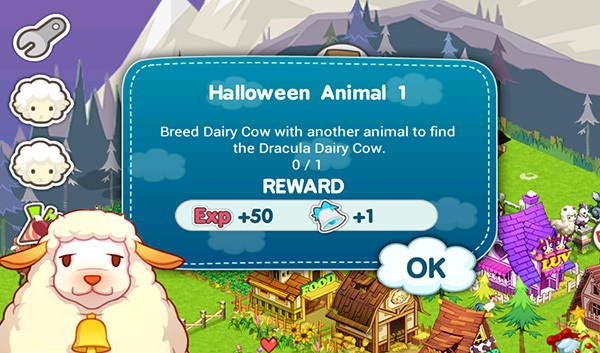 Halloween Prank 4: “Give love to the Dracula Dairy Cow in neighbor farm 3 times.” Like the other ones, you just need to find the animal in 3 different farms. 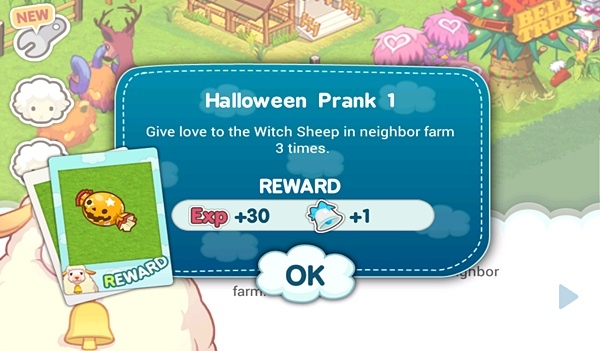 Halloween Prank 5: “Give love to the Zombie Alpaca in neighbor farm 3 times.” Same tip as the last one. The rewards for all of these are 1 Halloween Candy, 1 Bell, and 30 XP. 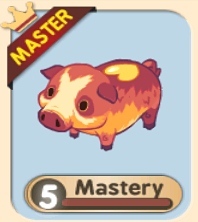 Edit on November 6th: I asked Com2uS on Twitter yesterday if the Skeleton Pig could be bred at any time of the year or just during the Halloween promo and it’s only during the promo. :(( At the time of the reply, there was just over 2 days left. But!!!! Look what happened!!!!!!! Now I can go back to giving Love Points to other animals instead of them Talking Pigs. 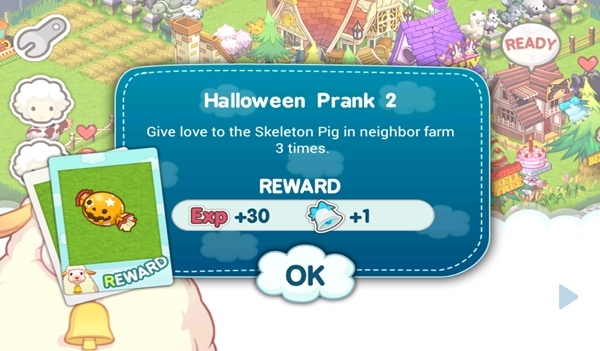 Truthfully, I was going back and forth between 2 Talking Pigs and 1 Talking Pig x a Brown or Black Pig since I read that you can get a Skeleton Pig with the latter method too. Whee~! Ghost Sheep~~~ Of course, I got the Ghost Deer as well but it’s not cute enough for me to care about! If you’re wondering where the rest of logs based on Iris went to, I wrote up separate walkthroughs for the Bronze (青銅の間) and Gold Spaces (黄金の間). This log starts at the point after all three Spaces are finished until the end of the game. 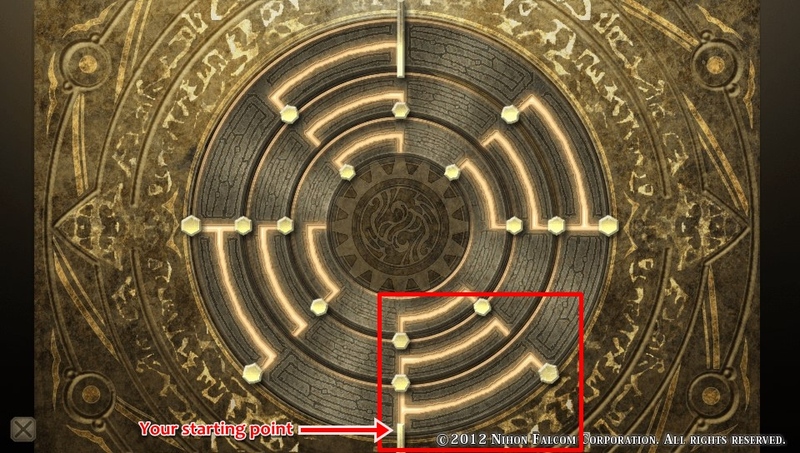 The touch puzzle may seem intimidating at first but it’s actually very easy once you understand the fact that your starting location can change. 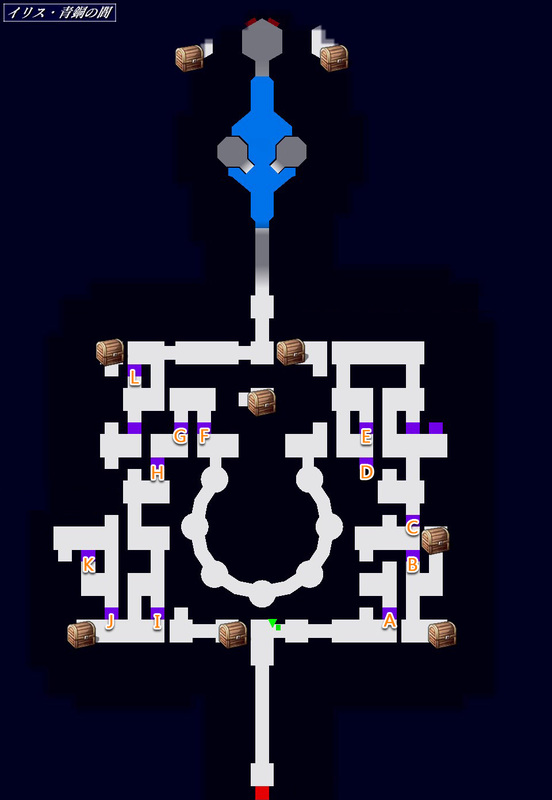 The overall goal is to conquer all 4 doorways (marked in the screenshot below as red dots) by moving 1 – 3 sections of the disc to connect paths to the platforms. 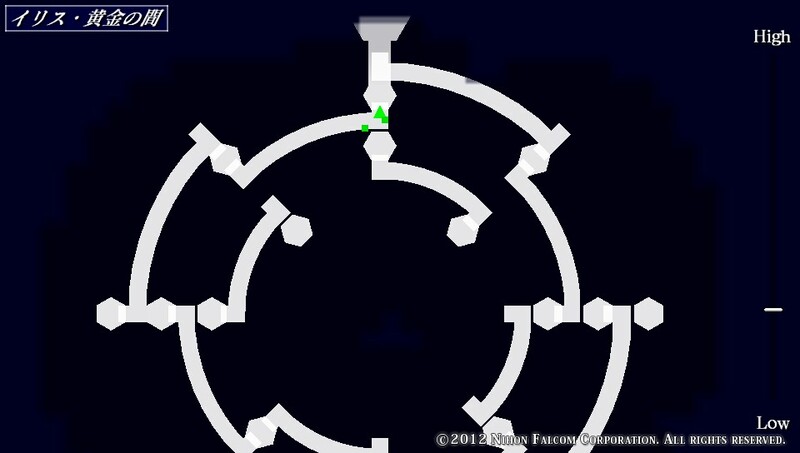 It’s impossible to reach all four doorways from the initial starting point. Having said this, there is an altar in front of each of the doorways which will act as a new starting point when you reach one. 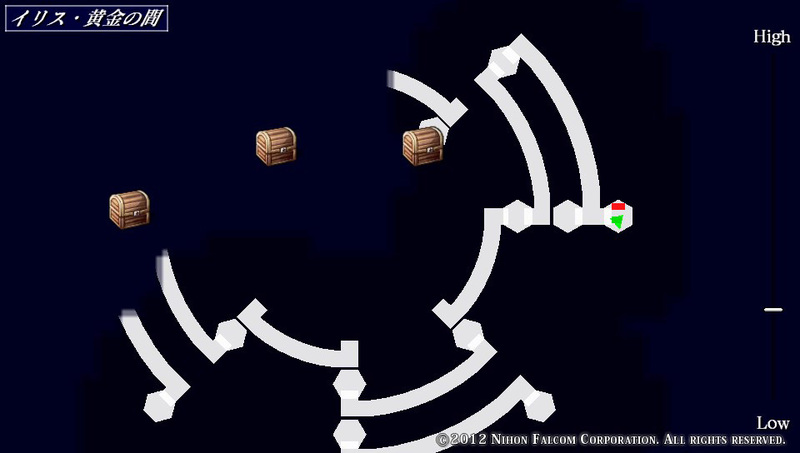 Each time you complete a challenge, one of the cubes surrounding the northern area will glow. 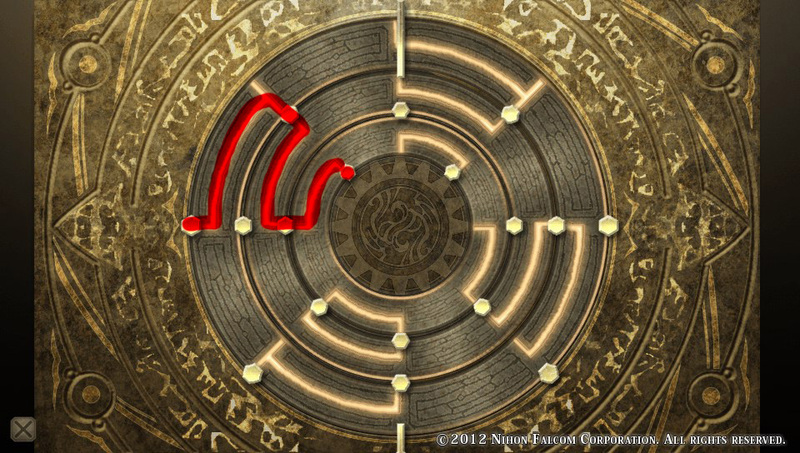 Once all 4 of them are activated, the gates to the north will be accessible. 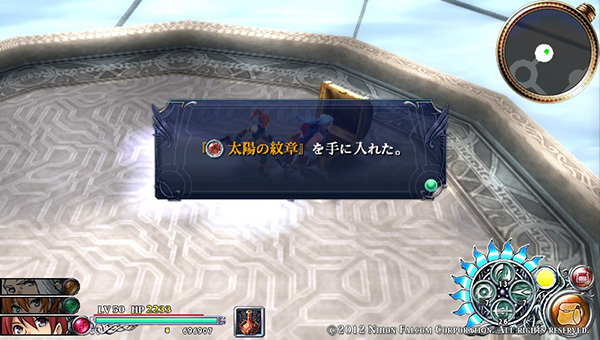 In the following screenshots, the treasure chests may not always appear. 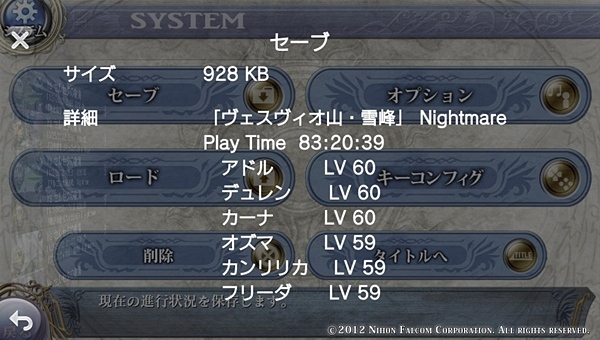 ^^ This is because I did screencaps with two different save games. 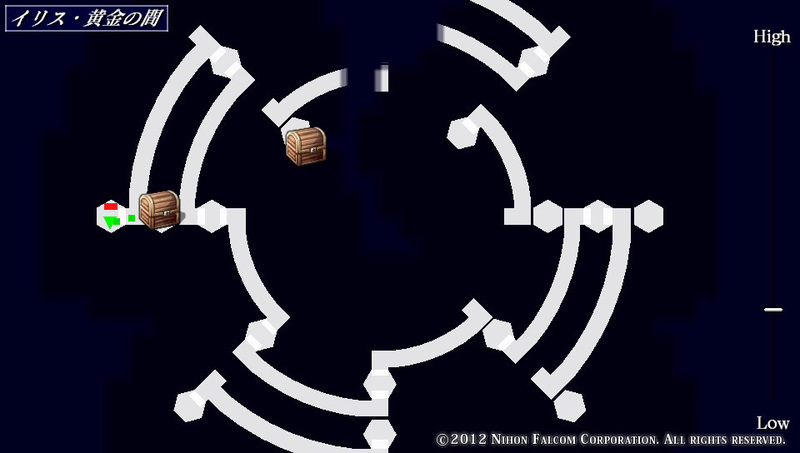 The northern chest is covering the platform a bit but I assure you that, just like the puzzle screen shows, you cannot reach that platform as it’s not connected to the starting point. The chest on the right side is, however. This one contains 10 Purple Cloud Stones (紫雲石). 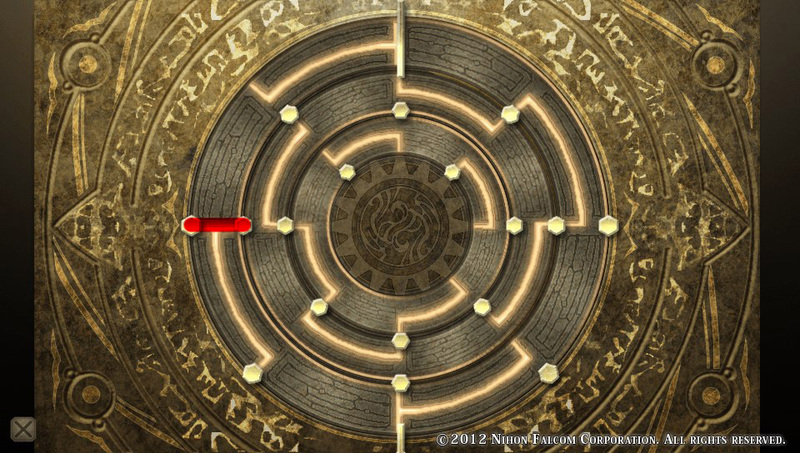 Incidentally, rotating the outer ring counter-clockwise once for the next path should get you to a gold chest on the left side that has Armageddon (アルマゲドン), a weapon for Canlilica. 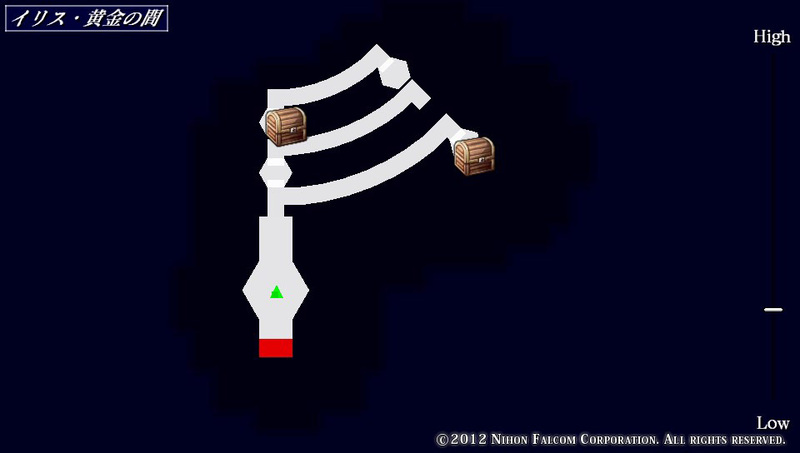 All solutions for connecting paths to chests are at the bottom of this guide. Click here to see the path traced out in a red line. ^^; Sorry for not using an arrowhead but I figure that having the mini map view as an accompanying reference source should be enough. 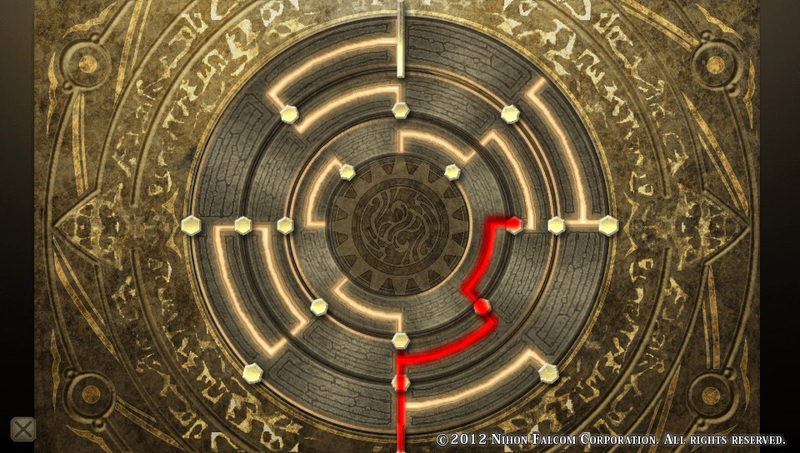 As you can see, the doorways are shown on the mini map as small red rectangles like regular exits. Enter through the one you’re in front of to fight a bunch of spiders. They are rather quick and can easily swarm you so take caution not to let them gang up on any party member. The fight here consists of a bout against hyperactive frog-like enemies. Like the spiders, they’re jumpy and rather quick. Ugh. 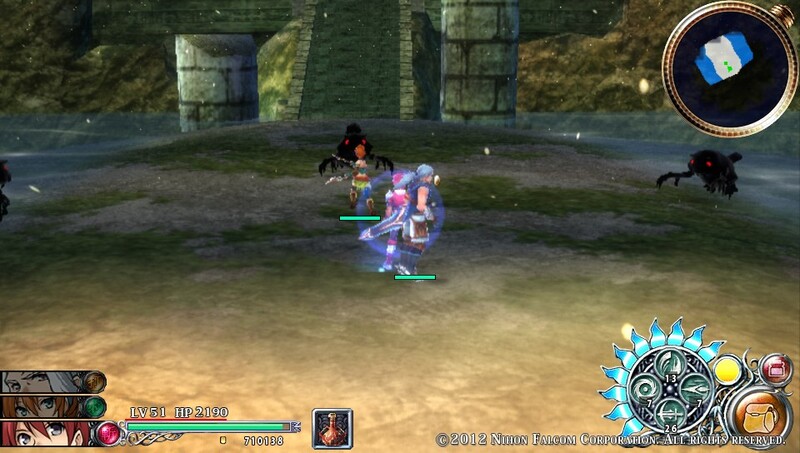 The monsters are those archer types that can be encountered in the Ancient Underground Ruin. 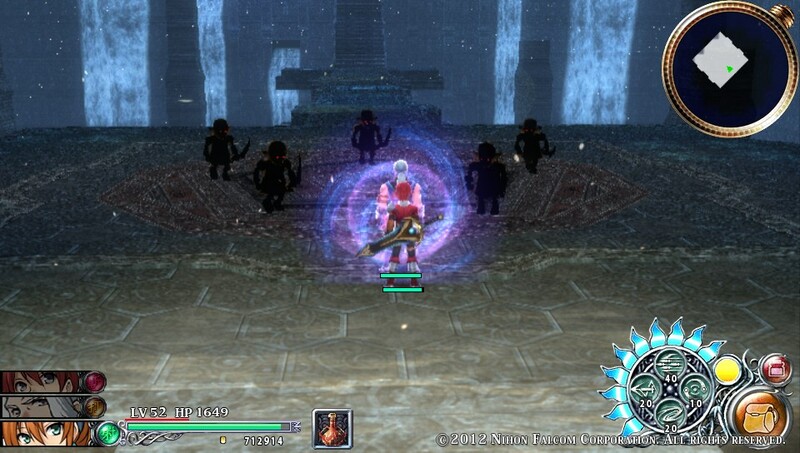 They’re slow but they can inflict a whole lot of status effects on the party. 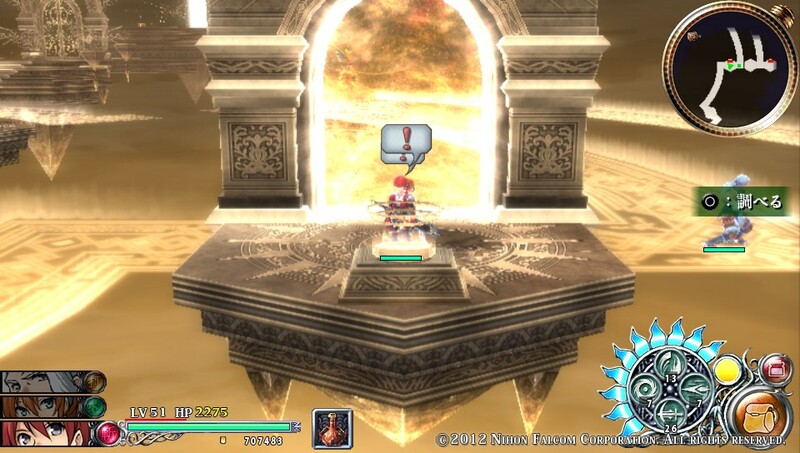 >_< The effects are removed when returning to the Gold Space though. 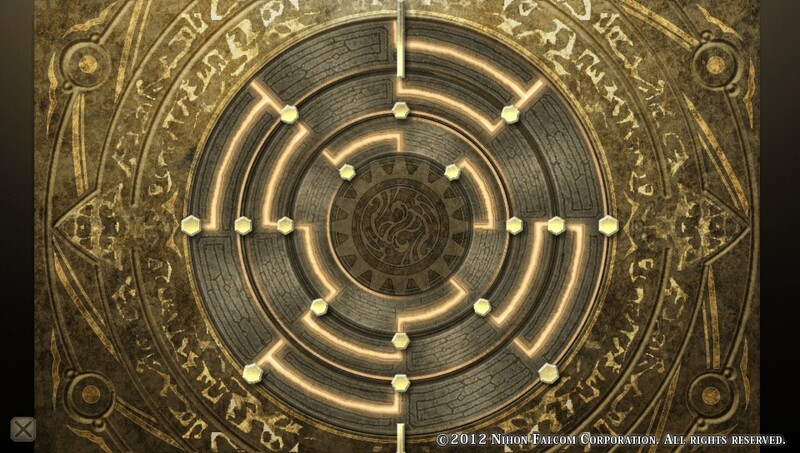 When all four doorways are completed, the northern gates will open to reveal a gold chest. 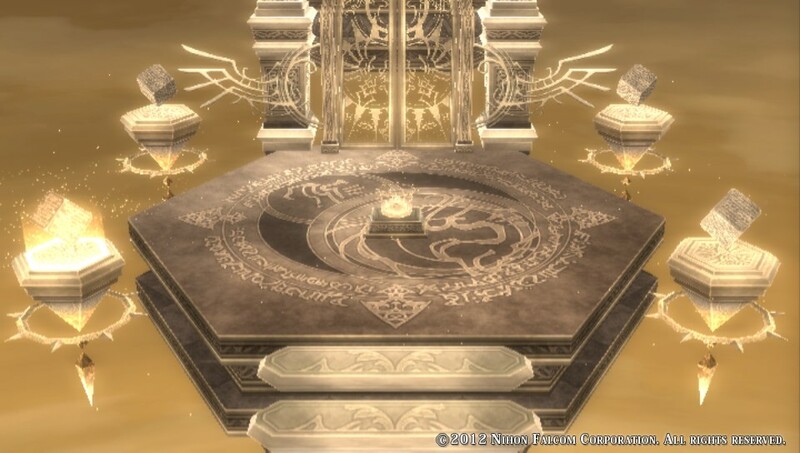 The gold chest sitting in the center has Ragnarok (ラグナレク), a weapon for Ozma. There’s a waystone up ahead which can only mean one thing! In fact, here’s a screencap of the boss: 😀 Although it’s pretty much a palette swap of the silver one, its tactics and attacks are different. Anyway, here are the solutions to getting all the chests. There may be other routes to them? Final dungeon, here I come! No wait. This is the second last dungeon, apparently??? I mean, there’s still a fire location left, I believe. I gots me some legendary weapons~! 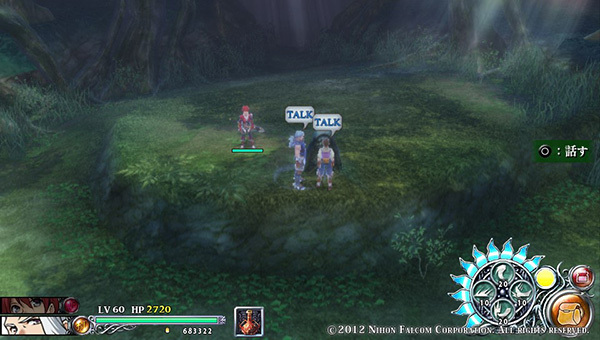 :3 I only made the ones for Carna and Adol. 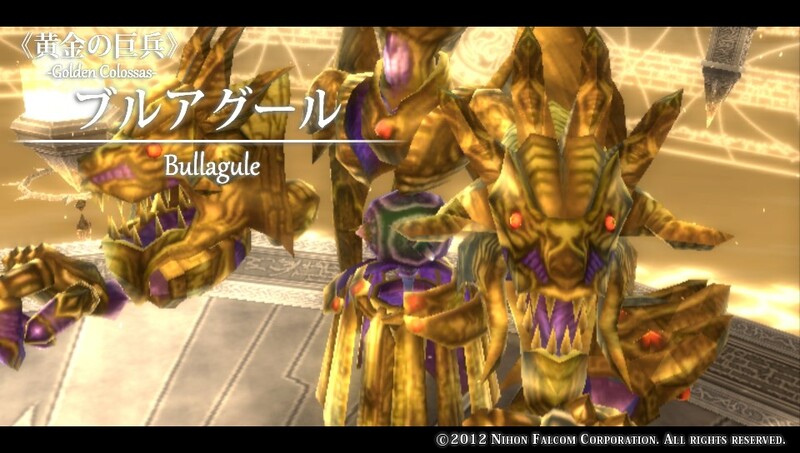 I’m going to get the third Sunstone (太陽石) soon and then use that one for Dulen. What’s cool is that you get an accompanying piece of armour every time you forge a legendary weapon! 😀 Yes, the initial weapon created completes the side quest but you can keep going back to Shiryu when if you have a Sunstone and have him make another weapon + armour. 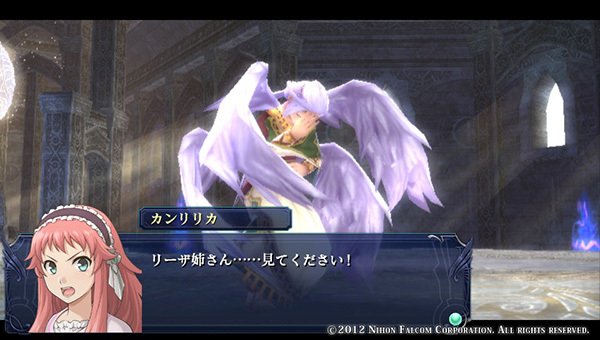 At some point in the battle, the boss busts out a sword that’s longer than Sephiroth’s. The battle on the whole is laughably easy on Normal. 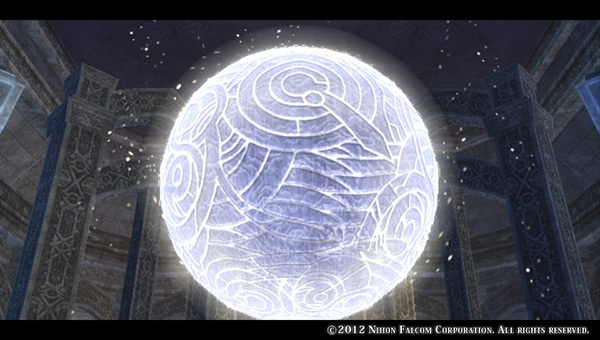 Incidentally, the Mask of the Sun is just kind of … lying on the ground for a good duration of the cutscene. 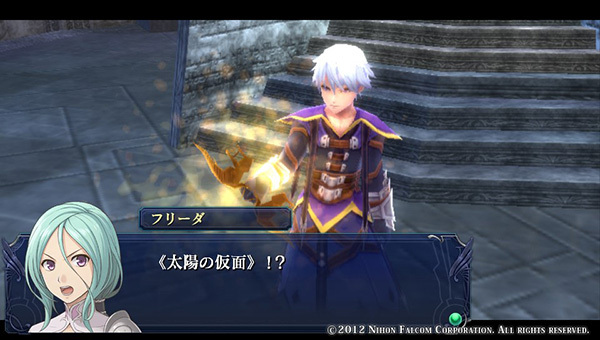 So, of course, in comes Gruhda … 9__9 This is literally a face-palm moment, folks. 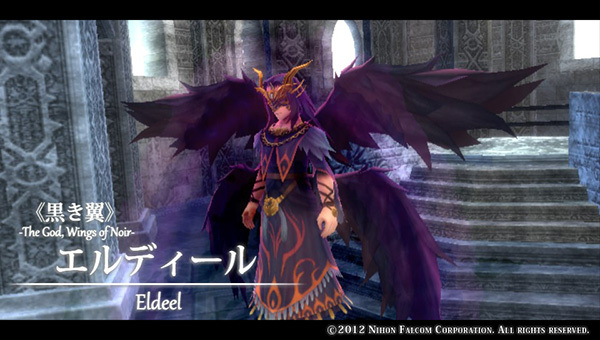 Seriously, at no point do you see Eldeel or anyone pick up the Mask of the Sun. I suppose they all figured that no one else was around but them. 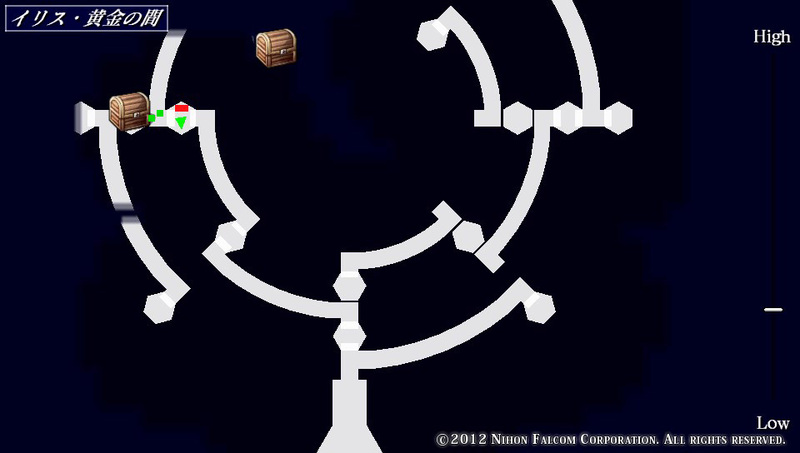 And this here is the start of a multi-part dungeon. 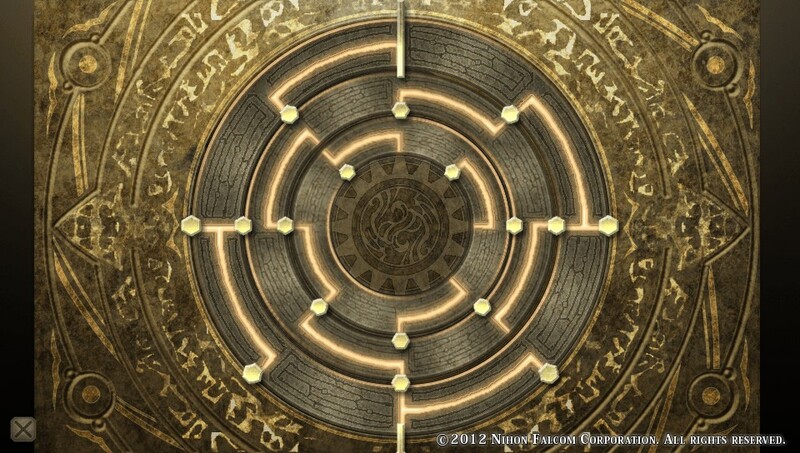 It’s divided into 3 spaces: The Bronze Space (青銅の間), Silver Space (白銀の間), and Gold Space (黄金の間). 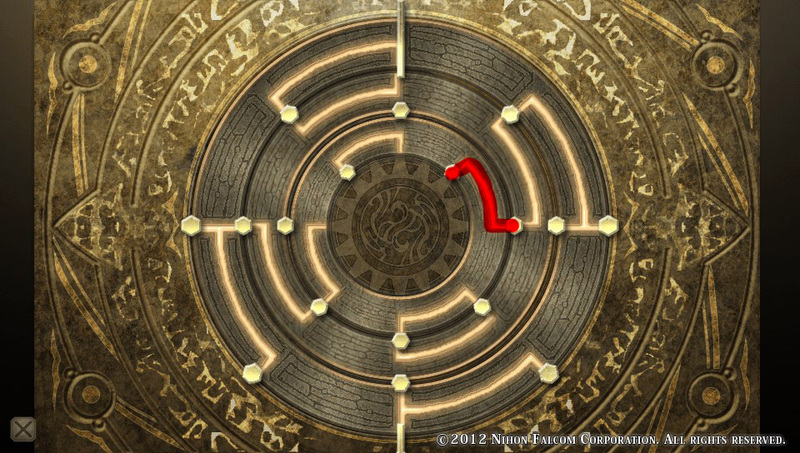 Each has its own distinct design and puzzles. 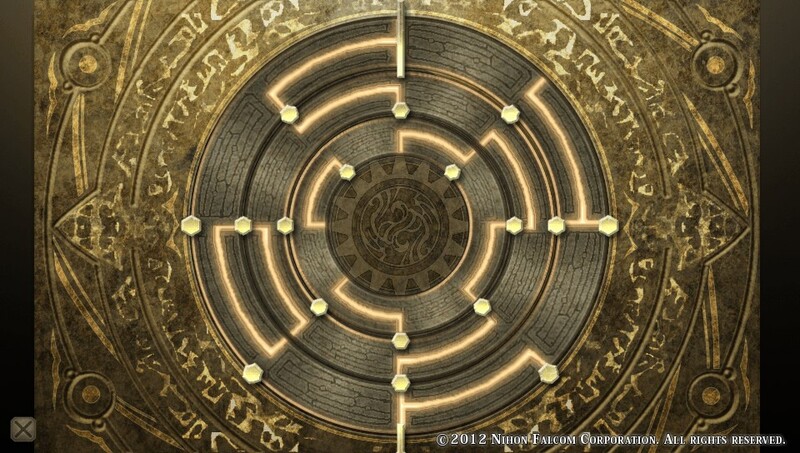 I took a peek at the bronze one last night but decided against it since I was too tired to figure out the path. The silver one requires less brain power since it’s almost reminiscent of those hand-holding type switch/triggers where you just touch something nearby to create a path or remove an obstacle before you can continue on. I must admit that it takes a teensy bit more thinking and effort this time since you have to find the “triggers”. 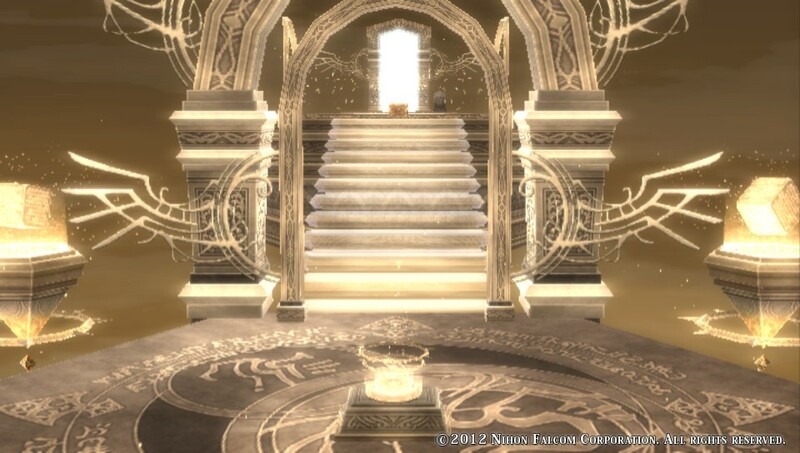 The gold one is pretty neat in that the entire room is a touch puzzle; you have to line up paths to make your way to the exit. 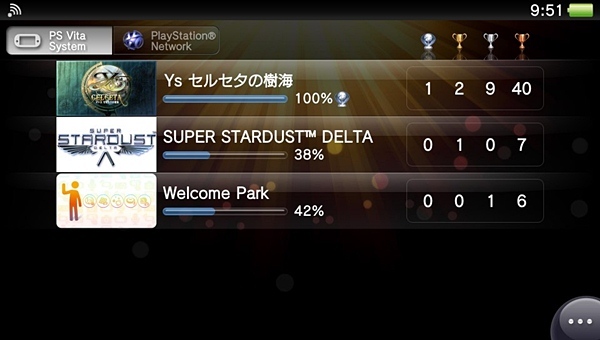 I will write the walkthrough for the Silver Space first because it’s the one I went through first. 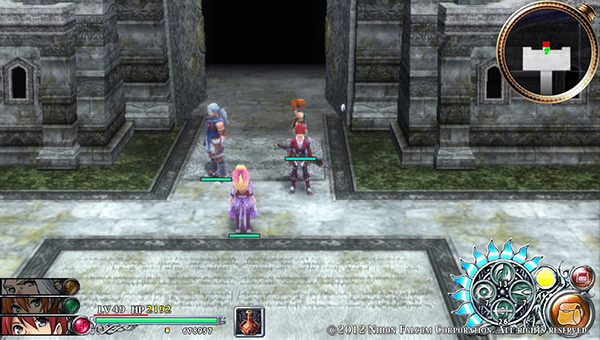 I would recommend having Adol in the main party since the living weapons are in this dungeon too. 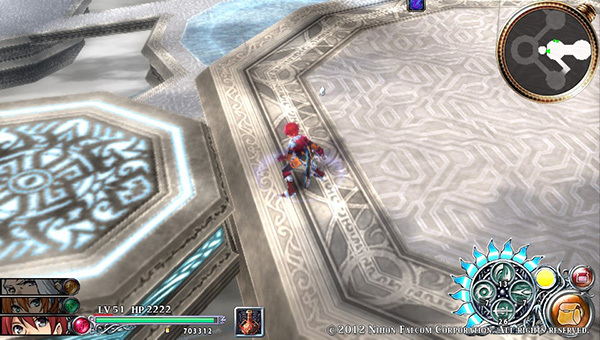 The starting floor is very linear. (I should note that the first enemies you come across have some sort of a sphere that can pull you in and trap you for the duration that it’s active. While in the sphere, you will suffer multiple damage.) 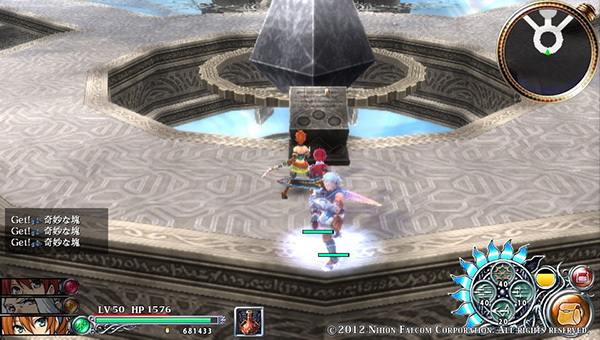 You will find a giant floating crystal and a pedestal of sorts in the third platform. 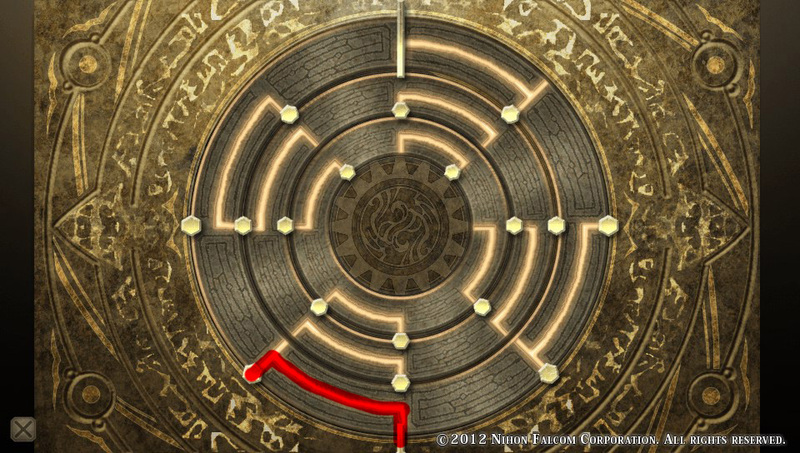 To the north of it is a golden hexagon-shaped plate on the ground. 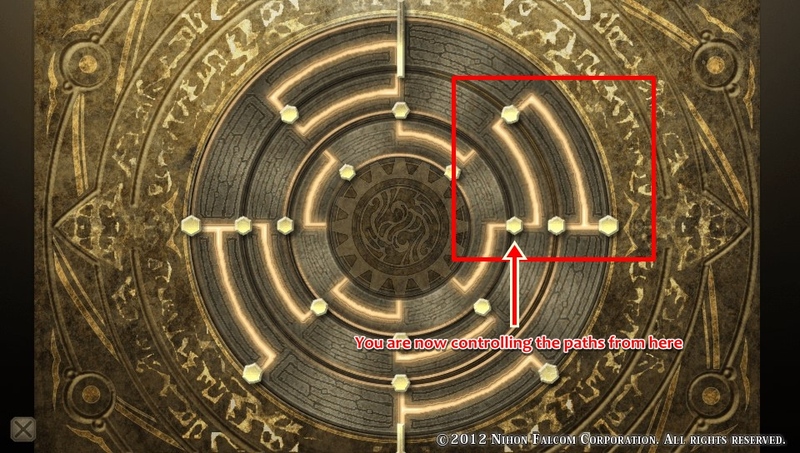 Your goal is to activate the plate by inserting a spherical crest into one of the slots in the pedestal. Proceed northeast to find a gold chest. It contains the Wind Crest (風の紋章). Go back to the pedestal and interact with it. 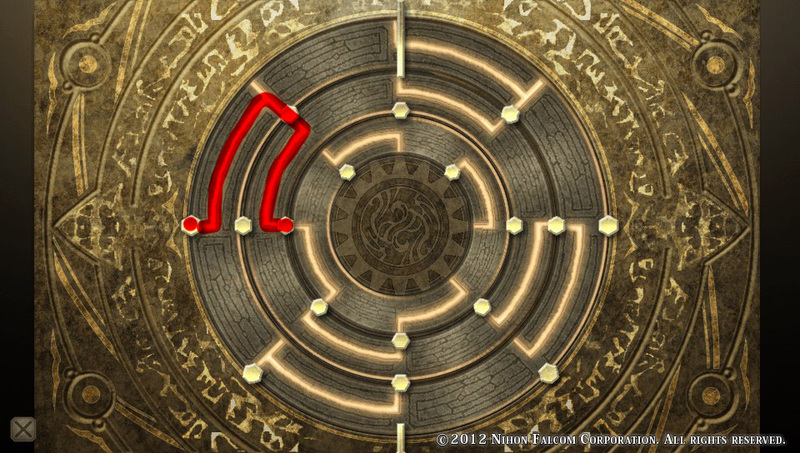 Once the crest is placed in the slot, wind shoots out a magical circle on the plate up north. Use the wind to get onto the upper level. Follow the path up. 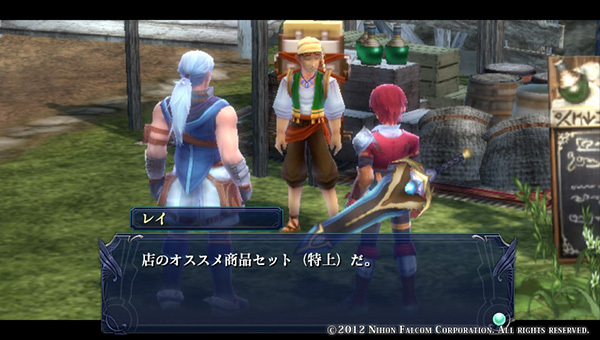 The regular chest you’ll see has Blue Crystal x 10 (蒼晶石). There will be gusts of wind coming from the southeast. Obviously, you’ll have to ignore that location for now and continue northwest. Soon, there’ll be another pedestal but ignore that too. 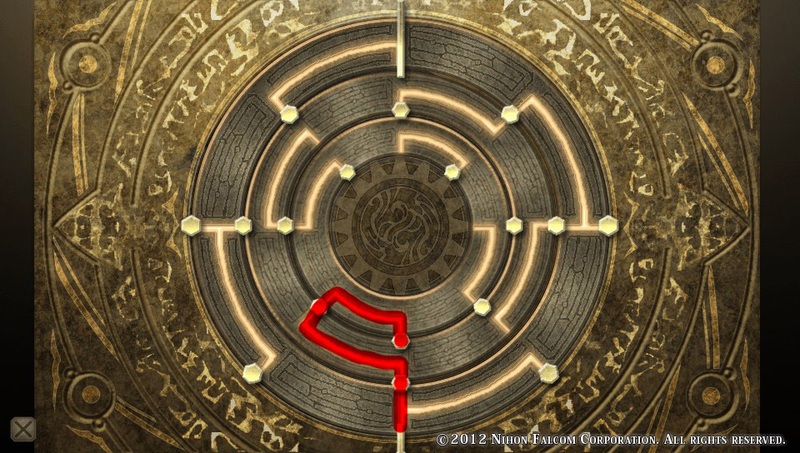 Take the west path up to a chest for Dulen which has a Hero Ring (英雄の指輪). Return to the pedestal and remove the Wind Crest from it and return to the southeast area with the gusts of wind. 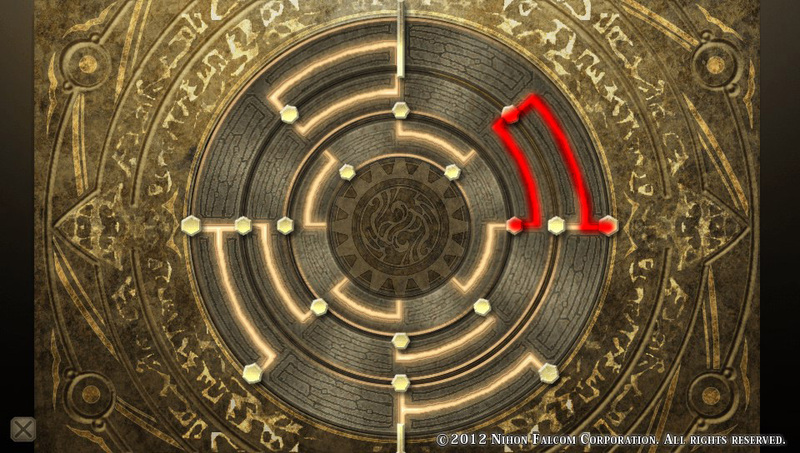 With the wind no longer present, go to the gold chest to get the Rain Crest (雨の紋章). 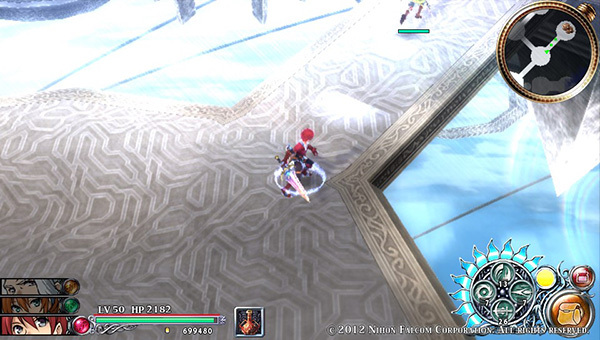 Doubleback to the floating crystal to the north and use the pedetal. 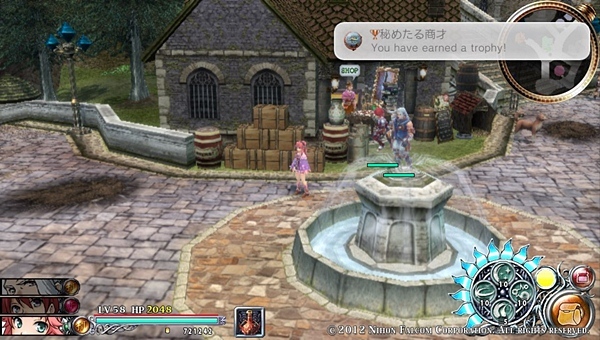 Select the Rain Crest. 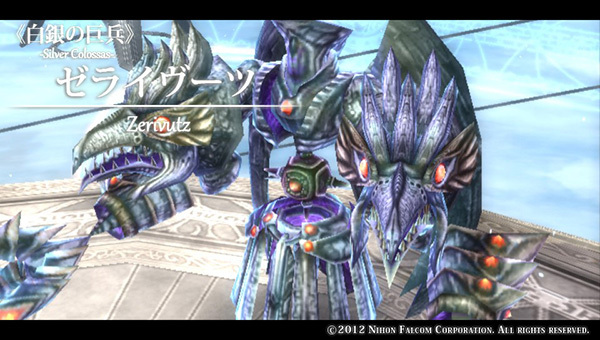 Equip the Water Dragon Scales (水竜の鱗) and then move north. Dive under to open the chests. 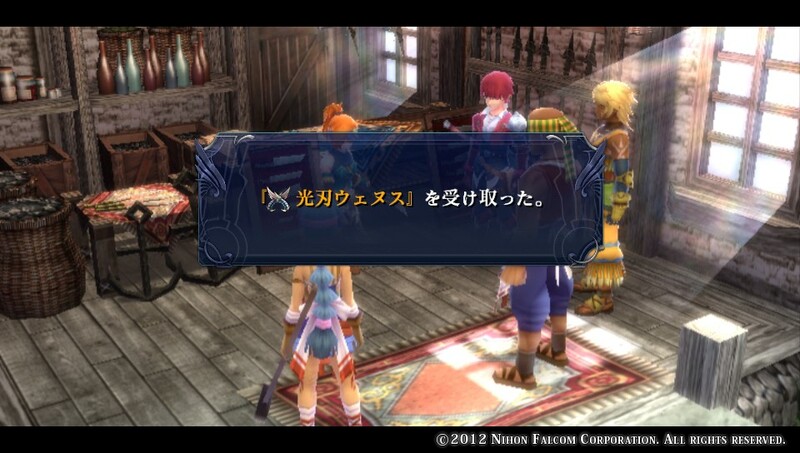 The gold one has Frida’s weapon, Elysium (エリュシオン) while the regular chest has a Heal Troche (ヒールトローチ). Remove the Water Dragon Scales so that you can move the group onto the dry land ahead. Once you get to the area where the path splits to going northwest and southeast, take the latter. You will be at a spot with three chests. Normal chest on the left has a Heal Troche (ヒールトローチ), gold chest contains a Valkyrie Dress +2 (ヴァルキリードレス), and there’s an amethyst (アメジスト) in the other chest. Go northwest now. 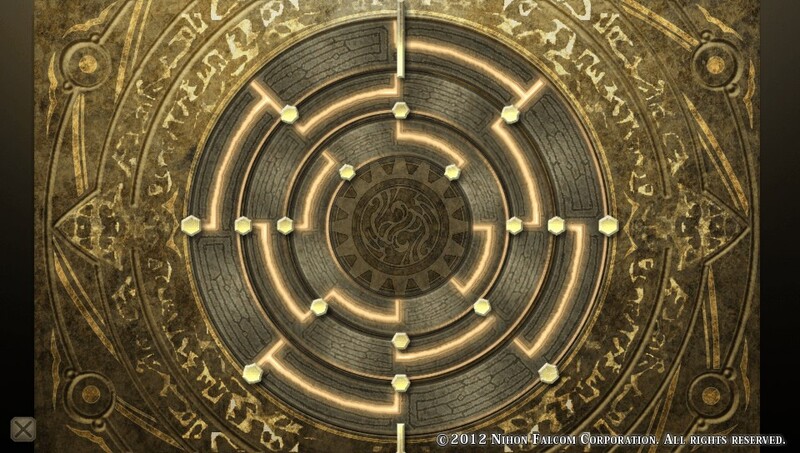 At the floating crystal, switch in the Wind Crest to trigger the magic circle over the plate to the northeast. 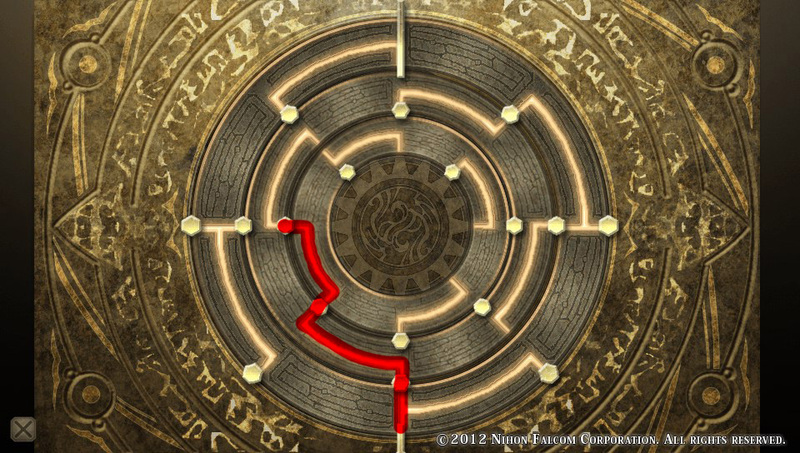 Go up to the next platform for the gold chest with the Sun Crest (太陽の紋章). Insert the Sun Crest into the pedestal to melt the ice barrier on the southwest side. There will be a chest along the way with Red Crystals x 10 (紅晶石). 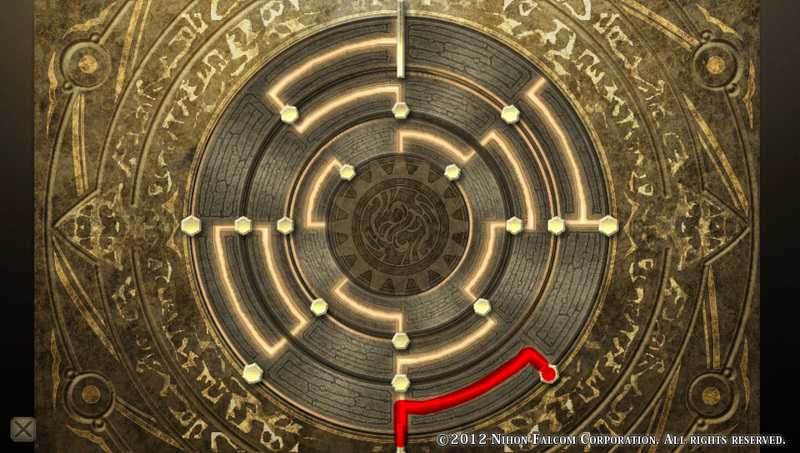 From here, keep heading southwest until you spot 2 chests appear on the mini map. Go to them. There’s a Kaiser Potion (カイザーポーション) in the normal chest and Warrior Mantle (勇士のマント) in the red one. Move southwest to the pedestal and put the Wind Crest in. Go northeast once and then northwest once and northeast again. There should be a hexagon plate here with wind. 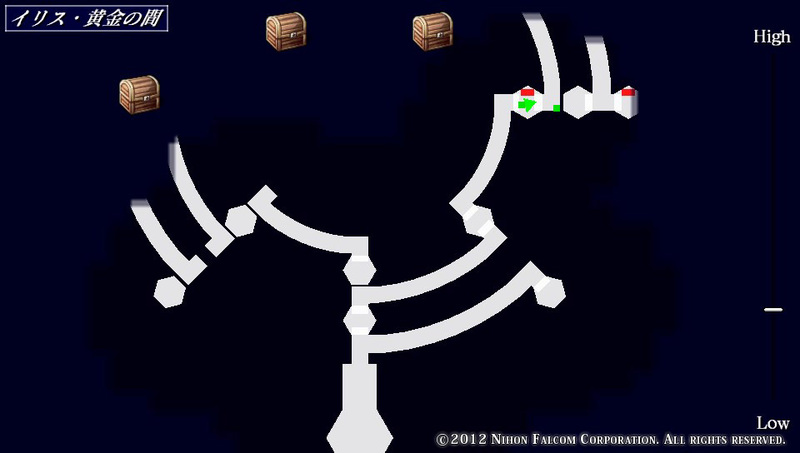 On the upper level, a gold chest is at the dead end to the north which has a Temple Cloth (テンプルクロス). Switch in the Rain Crest to raise the water level to the southeast. Once you go up two ramps, you will arrive at a platform that has a lift to the west. Take it to go back down. 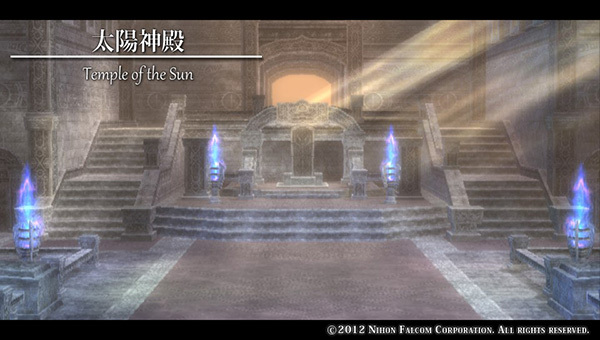 Go to the nearby pedestal to take out the Rain Crest and replace it with the Sun Crest. Get back onto the lift to return to the upper level. Head east. At the platform with the one living weapon monster, there’s a lift to the south that will bring you back to the beginning of the Silver Space. Ignore it and put on the Hurricane Boots (疾風の靴). Dash north up the vertical wall. 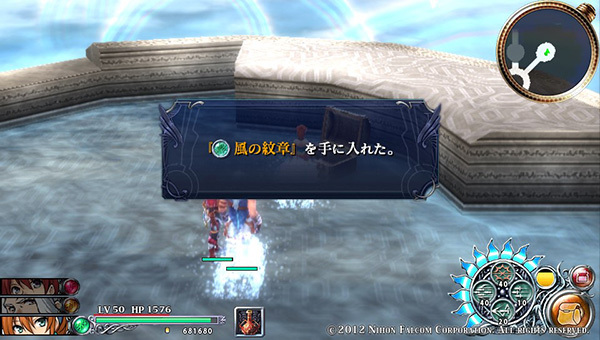 The gold chest in the middle of the platform has Carna’s weapon, Judgement (ジャッジメント). Proceed north for a waystone. There is a boss battle up ahead.